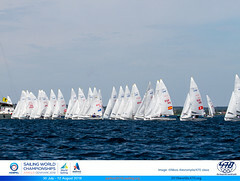 Ninety-seven teams from 24 countries are preparing to contest the 470 Class Junior European Championships on Lake Balaton in Hungary, which starts next Monday in the lakeside resort of Balatonfured. Ferdinand GERZ and Tobias BOLDUAN (GER) will be looking to go one better than Greece, where they finished runners-up to the French team in the Men’s/Mixed division. 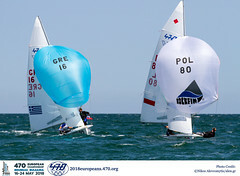 470 Junior World’s Bronze medal winners, the Italian brothers Luca DUBBİNİ and Roberto DUBBİNİ, carry the added confidence - or pressure, depending on your point of view - of having won last year’s Junior European title in Croatia. Certainly the brothers are one of the most consistent performers on the junior circuit and will be in the running for a podium finish once more. A number of teams from outside Europe are coming to take part in the regatta, notably from Singapore, Malaysia and the USA. But perhaps the leading threats to European dominance come from Argentina, the team of Sebastian PERI BRUSA and Santiago MASSERONI (ARG). They finished 7th at the recent Junior Worlds, but Brusa is hungry for a podium finish on Lake Balaton. “We expect to be on the podium. Obviously our minds are focused on winning the event, but being 2nd or 3rd would be fine also,” he said. With this year’s World gold and silver medallists from Spain and Israel not competing in Balatonfured, the strong German contingent must start as favourites in the 22-boat Women’s division. Annika BOCHMANN and Anika LORENZ (GER) are the defending European Champions and took bronze in Greece a few weeks ago, but they can expect some tough competition from compatriots Victoria JURCZOK and Josephine BACH (GER). This team learned a tough lesson in Thessaloniki after they were leading in the final Medal Race but sailed the wrong course, allowing the rest of the fleet to sweep past. That mistake cost them a silver and relegated them to 4th overall behind BOCHMANN and LORENZ, but it’s a painful lesson that will make them all the more determined to come out on top in the Europeans. The age limit for 470 Junior Championships is that competitors must be 21 years or under in the year of the regatta. 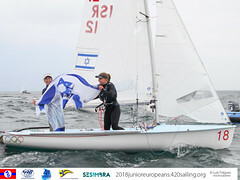 Despite their young age, the level of competition will be higher than many senior events, and the sailors that do well at this level tend to move on to equally great success at senior and Olympic level.